Auto accidents are the leading cause of death among teens in the United States. In fact, the two biggest dangers facing teenagers are risky driving habits and unsafe driving distractions. While drugs and alcohol are huge concerns for most parents, it's when these dangerous substances are coupled with driving that teens face even deadlier consequences. Eight teens die in alcohol-related crashes each day. And what are some teens addicted to the most? That's right, it's their cell phones. Texting while driving has become commonplace for many young drivers, and it kills 11 teens per day. 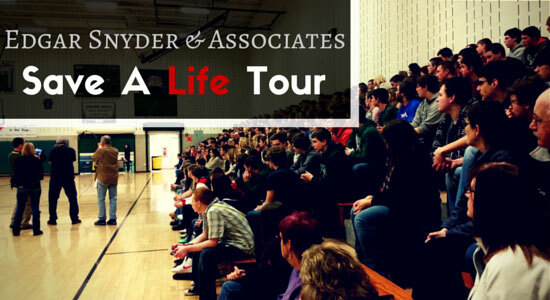 That's why Edgar Snyder & Associates is proud to sponsor the Save A Life tour. 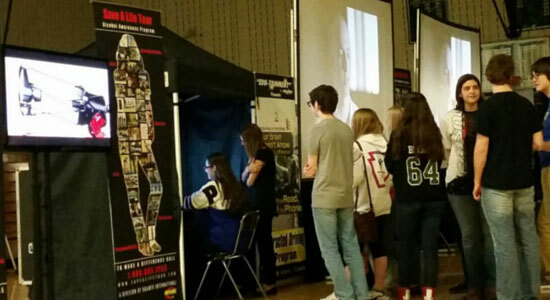 This interactive experience travels to Western Pennsylvania area high schools to highlight the dangers of drunk driving and texting while driving. Students witness a riveting and realistic video presentation, hear from a speaker who personally faced a related tragedy, and get a chance to drive state-of-the-art simulators. 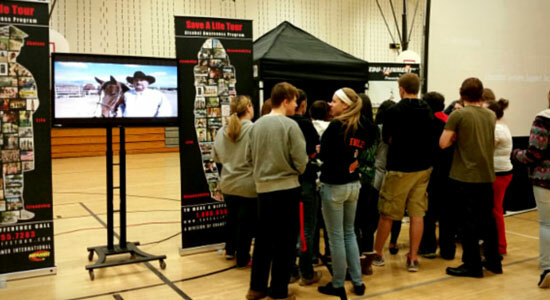 The Save A Life Tour driving simulators allow students to test their ability to drive safely when they are "intoxicated" or texting behind the wheel. The drunk driving simulator slows the students' reaction times, because reflexes aren't as quick when you're driving under the influence of alcohol. The texting simulator forces the students to drive while texting a friend via an attached iPhone. When asked, most of the students said they learned the most from these simulators. One Rockwood High School student said, "I learned that I can't text and drive, and I'll never do it again!" Dangerous driving decisions not only affect the drivers but everyone else on the road as well. And then there's a ripple effect that impact family members and friends. During the Save A Life tour, the students hear from a speaker whose life was personally changed forever because of drunk or distracted driving. This presentation struck a chord with many students who are seeing the real-life effects of poor driving decisions for the first time. It's our goal to help teenagers make the right decisions. Whether it's drinking and driving or texting while driving, we hope students take away the message that one bad decision can ruin lives. Teen driving accidents are a nationwide concern, and we're all committed to doing our part to keep our teenagers safe and healthy. That's why we hope you'll embrace teaching your teens to avoid dangerous driving habits and spreading the word in your community. Learn more about the program at the Save A Life Tour website. If you're interested in getting your school involved, contact our law firm at marketing@edgarsnyder.com. Don't forget to take our Safe Driving Pledge and commit to driving distraction-free and alcohol-free. It only takes a minute to sign up, and you will be entered for a chance to win a $100 Visa gift card. Were you, or someone you care about, the victim of someone else's poor driving decisions? If so, our law firm can help. One of the reasons why we sponsor the Edgar Snyder & Associates Save A Life Tour is because each day we see first-hand the devastating effects of drunk driving and texting while driving. We've helped thousands of accident victims and their families to recover the compensation they need and deserve to move forward with their lives. We're standing by 24/7, so call us for your free consultation now.